This weekend was the culmination of almost a year of planning. A weekend packed full for sure. 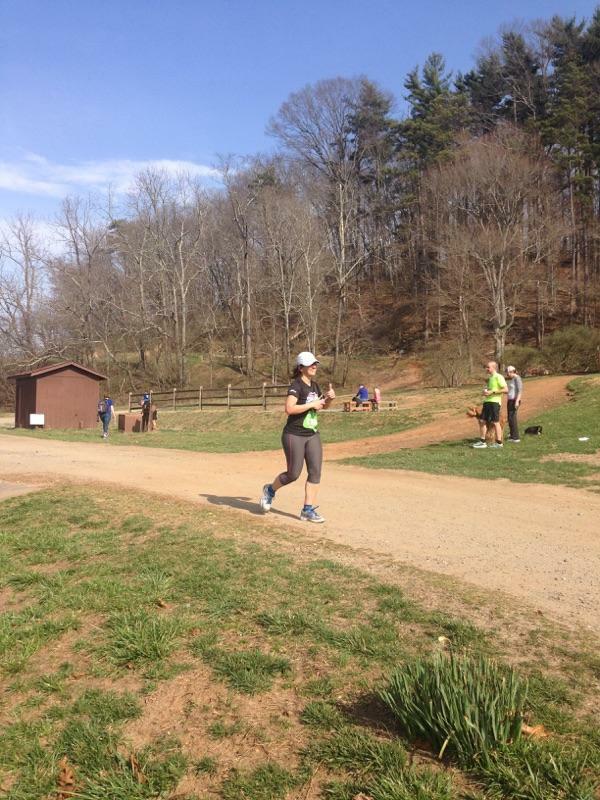 As an Asheville Marathon Ambassador, there was much more to this event than just training with my feet, but helping prep for this event and playing a teeny tiny role in helping it go smoothly. Daphne, who runs the IDaphe events, has an amazing setup and assistants… this experience has shown me how much planning it takes to make an event like this go off so well. As most half marathoners did, I came in on Friday for the expo to get my race packet. Half marathoners, full marathoners, and those completing the Vineyard Challenge were immediately greeted as they entered the Double Tree hotel, either by the info booth(that was me for some few hours), or the race waiver station. Runners picked up their packets, got their Expo bingo cards, goody bags, and flowed through the expo. Goody bags included a weekend schedule, gloves, a race buff, and some other goodies. The expo is the place to get to try free Roots hummus, buy those awesome Balega socks with all the sponsors on them from Fleet Feet at 2 for $10, try your muscle cream, visit Specialized PT, buy Biltmore Wine with custom race labels, Bani Bands, visit WCU booth, discounted shoes and clothes with Vertical Running of Black Mountain, and much more. Get your bingo card stamped at each vendor and submit to win a prize. Shirts and more are available at the Expo as well as listening to Danny Dreyer talk on Chi running. My Ambassador job on Friday included volunteering to get expo set up (thanks to Ingles for fueling our breakfast) and then info booth until I left for work. Ingles and Chic-fil-a were awesome to deliver lunch! Race morning, the race starts at 730 a.m. We were up at 5:15AM to get to Biltmore around 6am. It can take up to 30 minutes to get from the gate to parking depending on arriving traffic. After parking, we hit the port a potty, then headed to get photos with the Asheville Marathon Ambassadors by the barn. Smile! Then back off we all went to get race prepped. One more trip to the potty, bag check, we were in our spots 5 minutes before race start. The sun is already coming up, temps are in the upper 50’s… Conrad and I place ourselves by the 2 hour pacer guy. Conrad wants to stay close to help him PR today. I know I can’t keep his pace. I know going into the race I’ll race my own pace. I would love to PR (last year I did PR at 2:09:33), but I know I’m not as fast this year. And the race starts. Such a gorgeous course. The first mile starts out relatively flat. As you turn left to go up past the sheep pasture on your right, mile 2 starts. And this mile is a steady climb to the Deer Park Restaurant. As we pass it, and go around a corner, Mile 3 starts and we have a little over a mile of downhill! As you reach the main ticket booth, you take a right and spend from 3.3m-4.8m of a steady uphill climb. Just focus on the beauty. Its not so bad. As you crest, you hit water station 2, that has fuel (Honey Stinger gel this year) and you start the rolling hills of up and down for the next mile. As your are reaching mile 6, you reach the Biltmore House in all its glory! Many people find a place here to take a quick photo stop. Some at the back of the lawn, some by the house. I stopped for a quick photo here, but as I got back on the path, BAM, the 2:15 hour pacer girl was right beside me, so I bolted ahead. There wasn’t gonna be any of that today! But she sure was motivating. She just kept yelling positive thoughts to the ones who stayed with her! You go Kay! As you run to the house and back up the drive, Smile at Paul Jackson Photographers as they catch you in your happy place! The next 2 miles are practically downhill people! 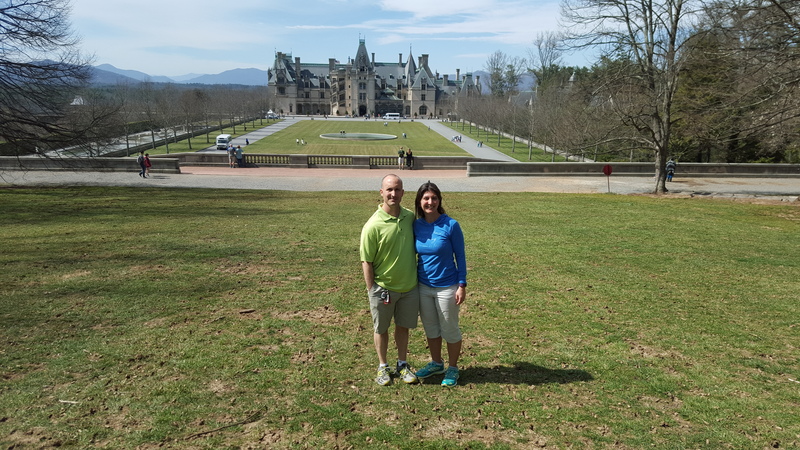 You run past the Biltmore Estate Gardens. They are just starting to plant and get ready for the Spring Plants. You’ll pass Bass Pond, and the waterfall, cross the bridge and as you reach the bottom of the hill, you’ll turn left. Another fueling station is waiting on you. This time, some fruit is there as well. You’ll do a short out and back. A bridge washed out earlier in the year with a flood, so we can’t use the same path they’ve used the last 3 years, so we re-pass the fuel station and head on down the road towards Antler hill until you reach the lagoon on the left. Now, remember, by this point, the trail is completely flat. You hit some dirt as you run past the lagoon, French broad on your left. You’re placed back onto the concrete path to continue on until you hit the gravel again. We are still running with the River on our left, fields on our right. Some awesome water stations are there about every mile at this point- dancing, cheering you on. You’re in mile 10 and 11 by now and need all the motivation I can get! The lady of the Bridge is there this year to smile as we pass the bridge that heads to the West side. This is where the troll has has been years past, but this is the new addition to the story. The sun has come up and it is definitely in the mid-60’s by now, and I’m worn out. Maybe starting to get somewhat dehydrated. I can’t decide if I just didn’t eat enough last night too. I personally think a few times I’m hallucinating and maybe I’d like to pass out. I hear Kay, my 2:15 pacer I’m trying to avoid get closer and closer. I don’t have the energy to fight it to stay ahead anymore, and I let her pass me….and the entire crew who stuck with her. Proud of them. And yes, she’s still cheering them on as if she is just walking today. Man, can I vote her for Pacer of the weekend??? And I just wanted to avoid her…lol. You keep going straight on the gravelly dirt past the awesome high-energy Young Life group at the Y (this is a location that you run straight, but also when you come back its only .5m to the finish! People are crossing paths here). What they don’t realize is that I would rather be running hills on asphalt than running this Gravely dirt on flat ground and I need all the motivation I can get by this point. Yay to Jordan D, Leslie S, and Amy B for cheering me on! About 3/4 miles down you’ll do a turn-around and cross a timing mat. Head back to the Young Life Water Station and now veer left to the last .5m. This is a slight uphill finish here. Legs are tired now. Just want to be done. As you get to the last .1 mile, my husband is standing on the corner (he’s been back about 14 minutes at this point) taking a video and picture of me coming through. The actual finish line is at the bottom of the hill after I turn right onto the asphalt. The finish includes amazing volunteers putting that gorgeous medal around my neck. I knew in advance I wanted to go home with a white finishers blanket… so I walked right up to the volunteer who had a white and beige one, and requested the white. With a big smile he handed it to me. Another volunteer hands me my water, lid off and ready to drink. Conrad met me at the finish, and we walked over for our finishers photos, then headed up to the food tent. Here you get to sign up for free massages (25 minute wait, but that’s fine). Eat my food and chat with Mindy and Brian as we wait, and eat. Roots is giving out free tubs of hummus and chips to runners. Michelob is giving out free beer to runners. Ingles food tent has bananas, orange slices, bagel halves, granola bars, Dove Chocolate, water, PowerAde… Its a nice atmosphere at the old barn/stables. The fun ended as we had to leave to spend the day with the kids at their events for the day though. So nice to watch Ian’s first outdoor spring soccer game! Back to the Expo real quick to buy my Balega socks and 2 bottles of the labeled wine to display. I figure since I worked my way as an ambassador for a free entry, that I could spend a little extra on the fun stuff. But let me tell you, Saturday night, bubble bath was amazing to calm the muscles and relax and stretch. I slept great! Sunday morning, Conrad and I got up early, he went in at 5:30am to help with the start line, and I came a little later to help him, then get awards going as the Awards Ambassador. It was a rainy morning today, but not too cold. We got awards set up, and were able to help give them out, and then clean up took us until around 2:30/3pm, then we helped more around to clean up. It was so cool to see the special people who obtained awards. The Backyard Vineyard Challenger jackets and medals were beautiful. Conrad and I chatted with the awesome local 2nd place overall male who just randomly picked up a transfer into the race from a friend a week before the race, unexpectedly offered to him. Then beasts out 2nd place! The woman who came up to me at the end of the race, worn out and completely shocked that she was notified she has won an award. She told me that she had only started running these distances recently and somehow kept getting age-place awards. She was so sweet and I took her picture with her prize and on the podium for her. I was so happy to see her so happy!Nonetheless, the weekend was grande. Busy. And I would do it all again. Daphne, Mindy, Amy are all amazing! Brian, Micah, Taylor, Tim and the rest are as well! The ambassadors do a great job of jumping in and helping where they all can.